It would take a book to assess and appreciate the effect of Hay’s Music Store on the cultural life of Stirling over the generations. Before its closure in 1996, the Store was in Friar Street, but previous locations were in Barnton Street and Murray Place. The Hay family served and supported every aspect of musical life in Stirling, from the provision of pianos ‘to harmonise with any style of furniture’, to serving the needs of choral groups and orchestras. They coped with the revolutions in musical development, from the first recordings and wireless broadcasts onwards, sustaining the business through two World Wars. They were never just a retail outlet, but personally involved in the world of music, as today’s subject shows. The shellac record is one of three, gifted to the Stirling Smith collections by Sheena Malcolm, whose mother purchased them at Hay’s in the 1940’s to help her practise her Highland dance at home. 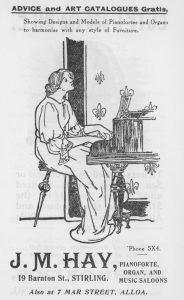 Sheena attended the dance classes of Peg McDonald and May Beattie. 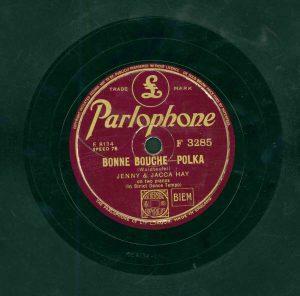 Recorded on the Parlophone label, the music is played by Jenny and Jacca Hay, on two pianos, “in strict dance tempo”. Sheena has fond memories of the big double–fronted store in Murray Place where there was great pleasure to be had in hearing the grand pianos, and where on occasion, stars like Kenneth McKellar would appear to sign their records.